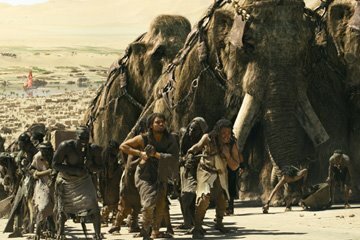 “10,000 B.C.” started taking theaters back in time March 7th. Making the natural selection of sound for the dub stage were sound supervisors Jeremy Price and Simon Gershon. The team got to play with some of my favorite sound effects in 2004’s “AVP” bringing that “Predator vision” back to the theaters. “10,000 B.C.” mixed at London’s De Lane Lea studios with Doug Cooper and Chris Burdon at the helm. Cooper mixed “Harry Potter and Order of the Phoenix” while Burdon dubbed last fall’s “Stardust”. Nico Louw handled production sound for “10,000 B. C.” as well as Robert Towne’s last, 2006’s “Ask the Dust”. Composing duties were divided among the team of Thomas Wanker and Harald Kloser. 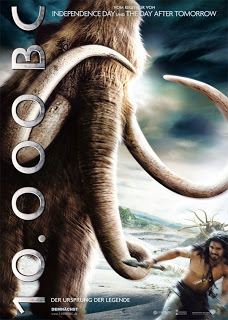 “10,000 B.C.” also marks Kloser’s debut as a screenwriter, sharing credit with director Roland Emmerich. The composing team’s next collaboration takes them into the future with 2009’s, “2012”. Here is the Q and A for 10,000 B.C. I wanted to thanks supervisors Simon Gershon and Jeremy Price for taking time out of their busy schedules to do this! DS: Some of the hardest sounds to create are those of naturalistic creatures. How did you guys approach the design of the many featured in “10k BC”? SG+JP: There are three creature characters in the movie, all of which were designed with elements of the real animal calls that they were visually based upon. The “mammoth” calls were made from a combination of female elephant calls we recorded at a Safari Park. (The male elephants were unavailable for recording as they were in “musk” which meant they were moody, separated from the herd, and would have trodden on anyone in their vicinity). Consequently, we were unable to make our own recordings of bull elephants and relied on gathered sfx from game parks and sourced recordings from wildlife recordists. The resultant library of calls were cut and divided into groups in the sampler and sweetened with other re-pitched animals (camels, bears, seals) to give them a larger, meatier sound. We ended up with a large palette of calls ranging from ‘mild rumble’ to ‘very-pissed off indeed’. These were triggered on the keyboard and recorded to tracks for further manipulation. Once played out we took the calls various stages further by morphing the calls with human vocal fx. The main trunk sounds were from the female elephants who didn’t seem too bothered having mics around their heads all day. Again, the edited blow fx were combined in the sampler with various sounds that either we made vocally or sweetened with blows from other animals (walruses, whales, dolphins). The sabre-tooth followed the same route as the mammoths. We were able to gain very close access to the lions and tigers at the safari park. Neither species like having microphones near them and happily provided us with a set of nice angry calls and charges. Whilst these were good foundation sounds, they suffered from the acoustic limitation of the pens and compound (nasty reverb and metal cage bangs) and we could never get close enough in the jeep once they roamed in the open. We were fortunate that one of our sound designers (Andy Kennedy) had a plentiful supply of the noises we were after and we were able to sample, sweeten and re-pitch the calls. We morphed various lion calls with foley tiger-in-water performance to give a wet personality to the sabre-tooth nearly drowning as it struggles in the trap, and having seen the film recently these are only just audible in the mix. The terror birds went through many stages in their sonic evolution. We initially went down the human vocal-only route taking ADR sessions with several vocal artists and creating a language of calls and noises. Then we moved onto bird calls (avoiding chickens, geese, ducks and pigs) and combined and morphed with heavier animals. Next, we went onto more of a prehistoric raptor feel. With some exotic birds we recorded bird and more angrier animals like walrus and even a dog with various degrees of Lfe added. As the CGI’s changed we adapted and changed noises to follow, (beak noise, feet fx. body fx, etc.) Eventually the terror birds ended up coming back to a combination of human calls made by Harald Kloser, the compossor/producer who was very involved with the sound, and some of the more successful raptor sounds as sweeteners to cut through in the mix. DS: How did this emphasis carry over into the backgrounds? Many of which could be populated with extinct creature call outs and beds. SG+JP: We made a library of prehistoric calls that could be bedded into the backgrounds for each terrain, either mountainous, jungle or desert. These were designed as textures that would always be there but never distracting or confusing. We didn’t want anything to be registered too much as there would be an expectation of that noise coming up later in the film. Winds and atmospheres were similarly classed, divided and laid accordingly. The forest environments were played up more than other locations, and we messed around more with pitching of insects, monkeys and bird calls. The deserts were kept very thin and delicate. This sort of movie relies less on atmospherics and any areas where gaps appear are usually filled with full-on score. DS: In addition to creature vocals, scenes like the wooly mammoth stampede must have been exciting and daunting at the same time. How did you sell their bulk, (especially when a heard of them was moving all at once) while still trying to maintain definition? SG+JP: Roland wanted the best part of the stampede sequence to play without music which was nice for us. We tried all kinds of ways to achieve the mammoth feet during this sequence. Whilst it was important to make a huge noise, we wanted to avoid a big mush and try to retain some definition and detail. We initially played with explosions, body falls and group stamping on various surfaces, all of which didn’t give us what we wanted. Ultimately, we found the best material came from sessions of recordings we took from punching various surfaces including buckets and bags of different soil using a variety of standard and contact mics. When re-pitched, these recordings formed the massive bulk movement sound we were after. We created further background mix-downs for the rest of the herd and spotted individual feet for the main on-screen mammoths. Foley detail enhanced and grounded the designed fx with surface and ground noises and we added separate low end events for Lfe when in close up. DS: I can only imagine the demand for unique foley for this film! With so many primitive props was there a lot of experimentation on the foley stage to get the sound right? SG+JP: Our foley supervisor Barnaby Smythe is a pretty primitive sort of guy; he grunts a lot and gathers and keeps the things that most people throw away. His stage contains a load of weird and noisy junk and multi-surfaced danger zones. We left the film at a pre-arranged location with some raw meat and a set of simple instructions. We don’t know how he does it …and we don’t want to know how he does it, but he came up with great foley. DS: There are scenes with crowds containing hundreds, if not thousands of people. Did you get any record sessions to help vocalize the films hordes? What other techniques are used to sell crowds of that size? a range of hammering, chiseling and general men at work sfx for the pyramid scenes in the film. DS: What was your first gig like? SG+JP: We both started out together on television drama back in the days when we cut dialogue, fx and foley on nasty 16 track Audiofile systems. Your sound track,Omar Sharif’s Narration and the the Music truly made this movie. To bad the Film Critics appear to have been Deaf. Respectfully Submitted, Eloi Amundsen and yes my Pen name indicates why I loved the film.